Jeff Bezos is making a big statement about Amazon Prime: You'd be silly not to join. 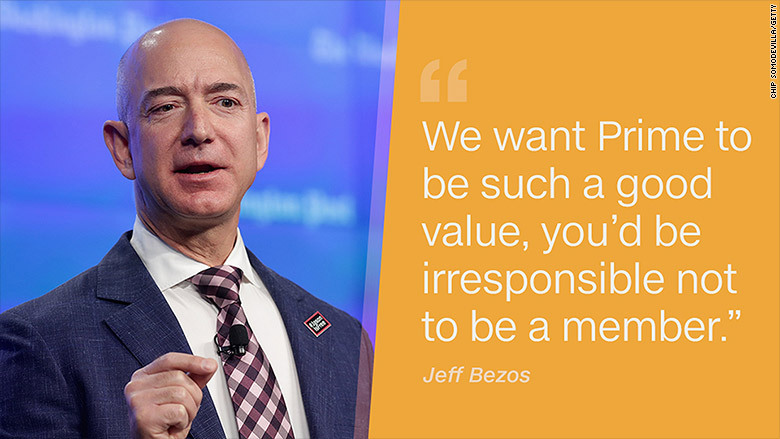 In his annual letter to shareholders, Bezos said Amazon wants people to believe that the $99 Prime membership is "such a good value, you'd be irresponsible not to be a member." 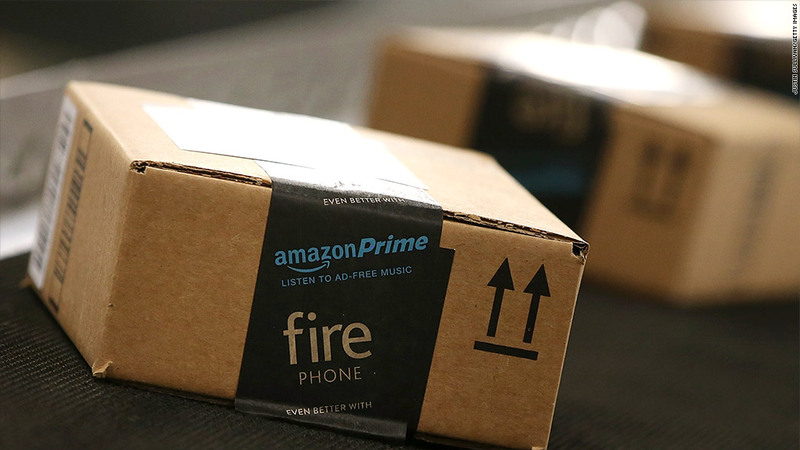 Prime started as Amazon's unlimited two-day shipping option for subscribers. There are now 30 million Prime-eligible items on Amazon. But Amazon (AMZN) has vastly expanded the service in recent years, adding Sunday delivery, same-day delivery, one-hour delivery, streaming music, unlimited photo storage and a lending library for Kindle customers. Most notably, Prime now includes Amazon's Netflix (NFLX) competitor, the successful streaming service called Prime Video, which has won Emmy and Golden Globe awards. Bezos said Prime Video is a big driver of business. He noted that Prime members who watch Prime Video are more likely to upgrade from a free trial to a paid membership, and they're more likely to renew their annual subscriptions, he noted. Amazon is notoriously secretive about the number of Prime members, saying only that "tens of millions" of people subscribe to Prime worldwide. But membership is growing fast, up 51% last year. "There's a good chance you're already one of them, but if you're not -- please be responsible -- join Prime," Bezos wrote. Amazon came under heavy fire from a New York Times article interviewing former and current employees who described Amazon's culture as stressful and uncaring. The company vehemently disagreed with the Times' assessment, and Bezos reiterated his love for Amazon's culture in the shareholder letter. He said Amazon isn't for everyone, but it can "fit certain people like a custom-made glove." Bezos said people self-select, noting that there are a wide array of companies with different cultures, suggesting that other companies might be better for people not suited to Amazon's "customer-focused" environment. "We never claim that our approach is the right one -- just that it's ours -- and over the last two decades, we've collected a large group of like-minded people: folks who find our approach energizing and meaningful," Bezos said. But Bezos praised the company's treatment of its employees, highlighting the fact that Amazon pre-pays 95% of tuition for courses that teach in-demand skills, even if an employee doesn't need those skills for his or her job. He also noted that Amazon gives spouses or domestic partners of employees paid maternity or paternity leave if their employers don't offer that benefit. "I can tell you it's a great joy for me to get to work every day with a team of such smart, imaginative, and passionate people," Bezos said.